Does Twitter’s Million Dollar Homepage push the limits? containing 1 million pixels for $1/pixel. mixed. Some thought it was brilliant, others thought it was stupid. As it turned out, it was stupidly brilliant; Tew made his million. Yesterday, a new site trying to become the Million Dollar Homepage of Twitter launched; 1MillionTweets.com is trying to sell one million tweets for $1 apiece. As one might expect, it received a similar reaction. TechCrunch’s Michael Arrington tweeted that it was “wrong on so many levels“. 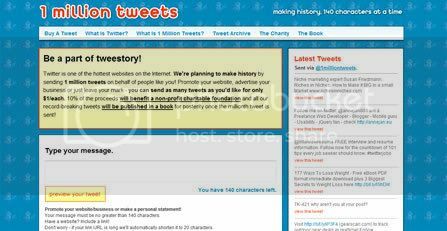 A blog covering the domain name industry called it a “clever Twitter idea“. How could something so wrong to one person be so right to another? That’s the nuance of community for you. The site’s creator, Blair Cummins, says he’ll donate 10% of the money he makes to a charity and that if he sells a million tweets, he has a publisher lined up to print a book with them in it. Will it work? Selling one million tweets is a real stretch; for obvious reasons it’s not quite like selling one million pixels. Additionally, there’s so much buzz on Twitter these days that I think it’s hard to maintain momentum. Even a major brand like Skittles has seen the buzz it generated with its Twitter experiment drop off relatively quickly. Time is relative and internet time is in a league of its own; this morning’s meme is like last week’s news. That’s bad news for anyone looking to build sustainable buzz (if there is even such a thing anymore). I decided to find out what 1 Million Tweets was about (besides $1m) and asked Cummins via email. He told me that he came up with the idea for 1 Million Tweets a few weeks ago and built the site over a weekend as he was experimenting with Twitter’s API. He explained that he’s researching a number of business concepts around premium content on Twitter and is also exploring “hybrid services“; standalone websites that are based on other websites but that enable non-members to interact with those websites in some fashion. When it comes to Twitter I think 1 Million Tweets shows how Twitter has gone mainstream. Since Twitter is open as far as developers go, that means that we’ll inevitably see more people looking to use it in different ways. And, yes, money will be increasingly be involved. On Monday, Tim Ferris, author of The 4-Hour Workweek, announced that he’d be donating $3 to charity for each new follower he gains during a certain period. And an Italian restaurant chain called Maggiano’s enticed Twitter users to “shamelessly” tweet a promo by offering an entry in a drawing for $100 gift certificates. All three of these concepts are similar in that they represent an exchange. Somebody is gaining something and somebody else is being compensated for providing that gain. Similar concepts seem to be popping up daily on Twitter, a sign of the service’s vibrancy. Since everyone keeps talking about Twitter as a marketing platform, is it any surprise that people are starting to treat it like one? Of course this doesn’t mean that all attempts are equal. Is selling tweets acceptable? Is ‘paying for‘ followers (in any manner) good marketing? Is sending tweets for the chance to win a prize appropriate? What’s worthwhile and what isn’t? I don’t know. It probably depends on which part of the Twitter ‘community‘ you belong to. What I do know is that as Twitter grows in mainstream popularity, some of the ideas that arise will inevitably push the limits of what various individuals like and don’t like. When Facebook opened up to the world, its original demographic (college students) complained about having their space exposed to the public. Today, those complaints are a distant memory and Facebook is more popular than ever. On the other hand Facebook’s attempt at taking advertising social with Beacon drew a fierce reaction and Beacon still pretty much remains dead. Perhaps the nicest thing about Twitter is that it’s flexible; users can easily adjust their use to suit their tastes. Not interested in seeing $1 tweets coming through @1milliontweets? Don’t follow. Not interested in tweeting “Follow @Maggianos by 5pm CST to be entered to win $100 in Maggiano’s gift certificates“? Let @Maggianos tweet for itself. Feel like something is missing when you have to follow someone to help a charity? Leave @tferriss to his own devices and donate $3 to charity on your own. Or if you think any of these are nifty or intriguing, use them. Making sure Twitter does for you what you want it to is, well, as simple as Twitter. You can take a million tweets to the bank on that. Google continues to redouble its efforts on its core business – advertising – and on Wednesday launched a beta of what it is calling “interest-based advertising“. When is a paid link not a paid link? Google has a major problem relating the identification of paid links, but I believe it has an even bigger problem relating to the definition of ‘paid links’, and the very term itself. Econsultancy’s Patricio Robles wrote about this earlier today so I don’t want to cover too much old ground, but I do want to comment on the difference – or similarity – between paid and commercial links.